Terming the Congress and Aam Aadmi Party as anti - poor, the Punjab Chief Minister Parkash Singh Badal today cautioned the people that if voted to power both of these parties would discontinue the several pro-people schemes and subsidies being currently given to people.Addressing the gathering during Sangat Darshan in Lambi assembly segment here today, the Chief Minister said that the SAD-BJP alliance government has taken a number of pro-people initiatives like Atta-Dal, Pension, Shagun, Mai Bhago Vidya Scheme, Bhagat Puran Singh Sehat Beema Yojna and others to facilitate the people. He said that besides these the state government was giving free power to farmers and weaker sections of society worth several thousand crore rupees annually. Mr. Badal said that these schemes have immensely benefitted the people especially from the weaker and underprivileged sections.However, the Chief Minister said that both Congress and AAP have a proven track record of being anti - poor and anti - Punjabis adding that God forbid if, in any case, these parties were voted to power they would discontinue all these schemes thus leaving hapless beneficiaries in lurch. Citing the examples, he said that during his stint as Chief Minister of state Captain Amarinder Singh had discontinued free power to people and welfare schemes were a distant dream. Likewise, Mr. Badal said that AAP government in Delhi led by Mr Arvind Kejriwal has done nothing tangible on the welfare front adding that even its leaders in Punjab were insulting beneficiaries of pro - poor schemes by terming them as beggars. “These people are virtually good for nothing and the future of people especially from poor strata of society can never be safe in their hands”, he added. Similarly, the Chief Minister said that neither Amarinder nor Kejriwal would ever visit every village of state to hold Sangat Darshans for redressing the grievances of masses. He said that not only Amarinder and Kejriwal but none other Chief Minister in the country prefer to undertake such a mass exercise to mitigate the woes of common man. “So before casting your vote carefully distinguish between your sympathizers and enemies so that your future is in safe hands”, added Mr. Badal.Later on Interacting with the media persons at village Channu, the Chief Minister said that Captain Amarinder Singh was lying on the issue of Satluj Yamuna Link (SYL) canal. He said that every child in the state was aware of the fact that the plan to construct SYL canal was conceived and executed by the Congress government and the foundation of this ‘sorrow of Punjab’ was laid by the then Prime Minister Mrs Indira Gandhi. Mr. Badal said he could not even dream of approving any such project that was against the interests of state and its people adding that Amarinder was blatantly lying on this issue just for misleading the people.Slamming the Aam Aadmi Party leadership for equating beneficiaries of Atta-Dal scheme with beggars and attacking the media, the Chief Minister said that it would be disastrous for state if they were voted to power. 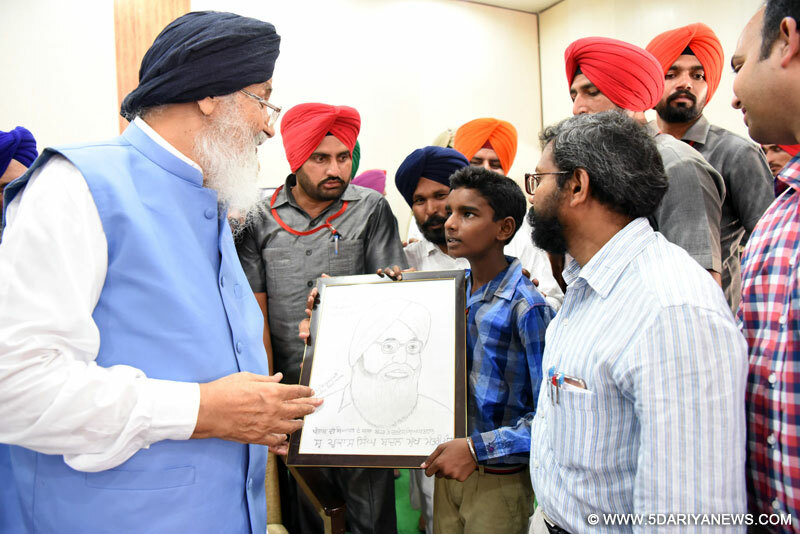 Mr. Badal said these immature people were complete misfit for public life and were not capable of providing good governance to people.On the formation of a new front in the state, the Chief Minister said it was of no use. He said that people without any administrative experience, contribution and sympathy towards state were forming such groups, which would hardly have any impact on state's polity. “Many such more groups will emerge before the polls but will be sent to political oblivion by the electorate, which will out rightly reject them”, he added.On another query, the Chief Minister said that there was no competition of SAD-BJP alliance in the state in the upcoming assembly polls and the alliance was all set to form government in the state for third successive term. He said that the people of state were with the alliance due to its pro-people and growth oriented policies. Mr. Badal said that due to such policies the alliance would form government for the third term in the state.The Chief Minister was accompanied by Chairman Punjab Agro Jathedar Dyal Singh Kolianwali, SGPC Member Jathedar Bicker Singh Channu, senior Akali leader Mr. Paramjit Singh Lally Badal, District Coordinator SAD Mr. Avtar Singh Vanwalla, Director Punjab State Tube Well Corporation Mr. Harmesh Singh Khuddian, Member Punjab State women Commission Bibi Veer Pal Kaur Tarmala, his Special Principal Secretary Dr S Karunaraju, Deputy Commissioner Mr. Sumit Jaranghal and Senior Superintendent of Police Mr. Gurpreet Singh.